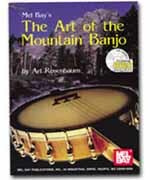 A complete survey of traditional banjo styles complete with tunings, playing tips, and the author's deft drawings. Progresses from easy tunes for the beginner to more difficult pieces. The styles include up-picking or Pete Seeger's basic strum; two-finger picking; three-finger picking; and what had variously been called frailing, clawhammer, knocking, rapping, overhand, fram-style, flayin' hand, and other Appalachian names, here called down-picking.